What guarantees come with my MePad? You get a 10 year structural guarantee. All electrical and plumbing work is completed by fully registered tradesmen. 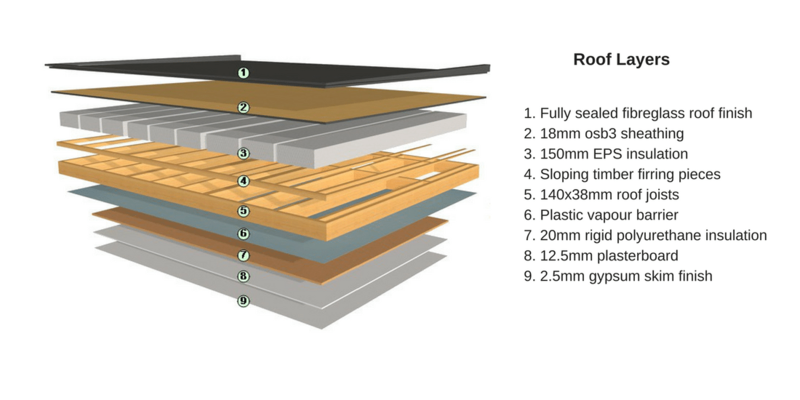 In addition, manufacturers’ guarantees for windows, roofing, flooring, etc. are also given. Can I put in a MePad without planning permission? The vast majority of studios we install are exempted from planning under Class 3 of the General Exempted Development provisions of the planning regulations. The size limit for no planning is 25 square metres (268 square feet). There are some other conditions which we can go through with you in greater detail once we have surveyed your property. Payment in three stages. 30% deposit, 50% on delivery, 20% on completion. Does Shomera do all the work associated with the build & installation? We price your MePad assuming a cleared and level site. We insist on doing all our own foundations as it is such a critical aspect. If demolition, levelling or clearance is required, we can cost and complete this work. On completion, all you have to do inside is to paint. Walls are plastered and ready for painting and the skirting is primed. External landscape completions are the responsibility of our customers but we can assist with this element. What external cladding do you use? We use larch as our preferred cladding. The larch is FSC certified and goes through a vacuum pressure-treatment prior to installation. Having used many different claddings, larch offers an excellent balance of performance and minimal maintenance. How often does the cladding need to be treated? Rather than letting the timber weather to a grey colour, the vast majority of our customers prefer to retain the natural timber colour. Depending on orientation, etc. the typical cycle of maintenance is every 5 years but can be as long as 10 years. Treatment is easy as the only preparation required is to clean down the cladding prior to applying the treatment. What windows and doors do you use in the MePad? The windows and doors are double-glazed uPVC, with the advantage of being made from a naturally insulating material. The double glazed units come with tempered glass as required and the double glazed vacuum is filled with Argon gas. 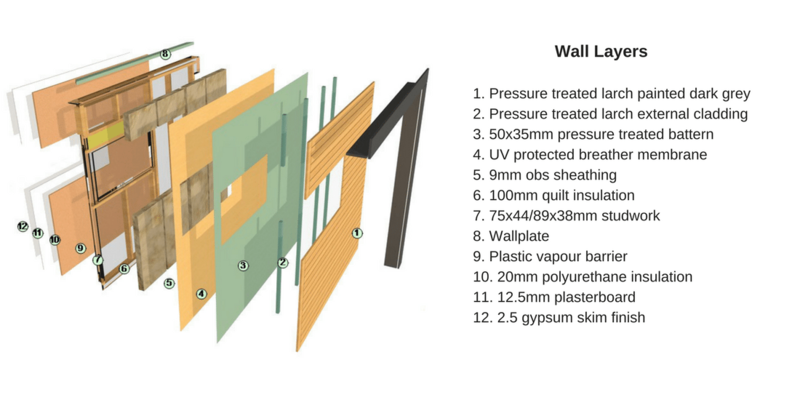 The window frames are 90mm and passive house standard. Windows and doors are available in Dark Grey (Slate Grey, RAL 7015) or Light Grey (Silver Grey, RAL 7001). How well insulated are the MePads? You will be warm and comfortable 365 days a year because of the insulation and air-tightnesss of our studios. With over 10 layers in the walls, 8 in the roof and 5 in the floor the weathering and insulation ensure a warm, dry space to enjoy your home. 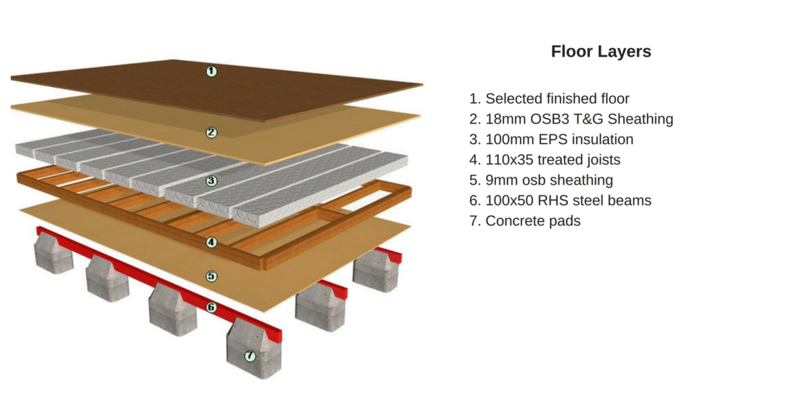 See below for the make-up of the floors, walls and roofs. How are the foundation and floors built? How are the walls built? How are the roofs built? How long will it take to get my MePad installed? What sizes do the Garden Studios come in?